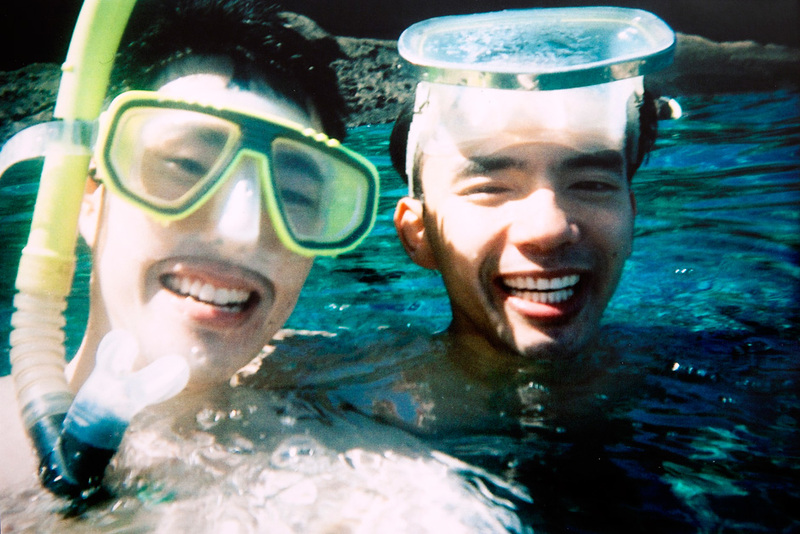 When Dave and Jenny asked me to film their wedding in Maui, there was no way I could say refuse. Soon1 I found myself in the only place in the world where Koa grows, and every tree I passed made me wonder if it would eventually be made into a ukulele or guitar. I was only there for two days, but it was worth every moment in the delightful weather, spending time with some of the nicest people I’ve ever met. The entire wedding group gathered for dinner at Mala restaurant, overlooking the Pacific Ocean and the islands of Lanai and Kaho`olawe. 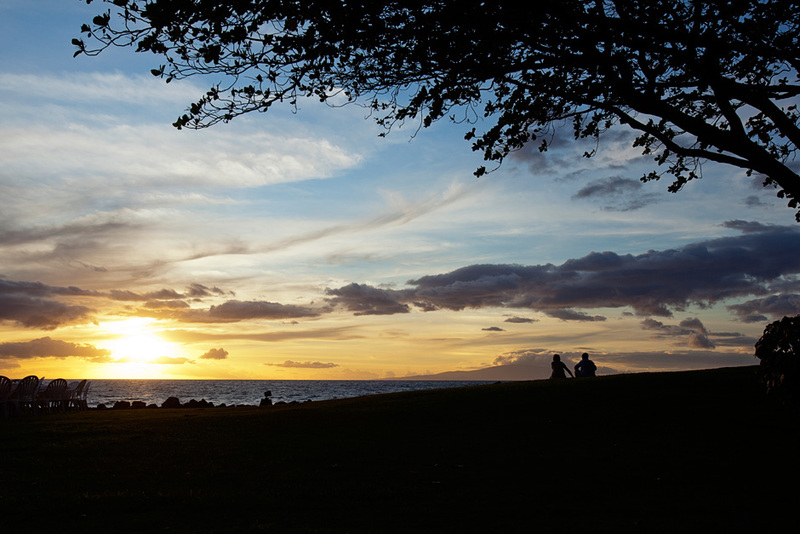 At this time of year, the Maui sunset passes in the blink of an eye. I learned that there are only twelve letters in the Hawaiian alphabet (which is why so many of the words look the same to me), and the language uses Spanish vowels. 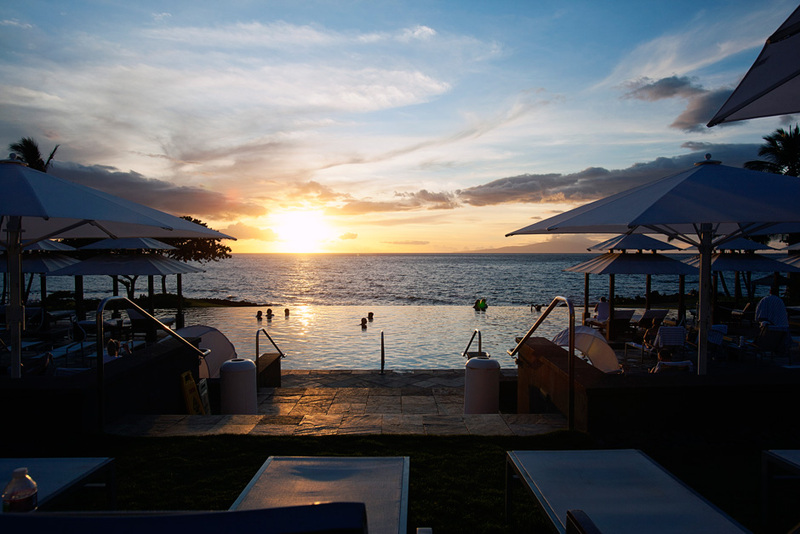 Each vowel is usually pronounced by itself (Wailea is said “Why-lay-ah”). I was surprised to see most signs in both English and Japanese; it turns out there used to be a significant Japanese community in Hawaii, although most of the Japanese tourists go to see Pearl Harbor instead. 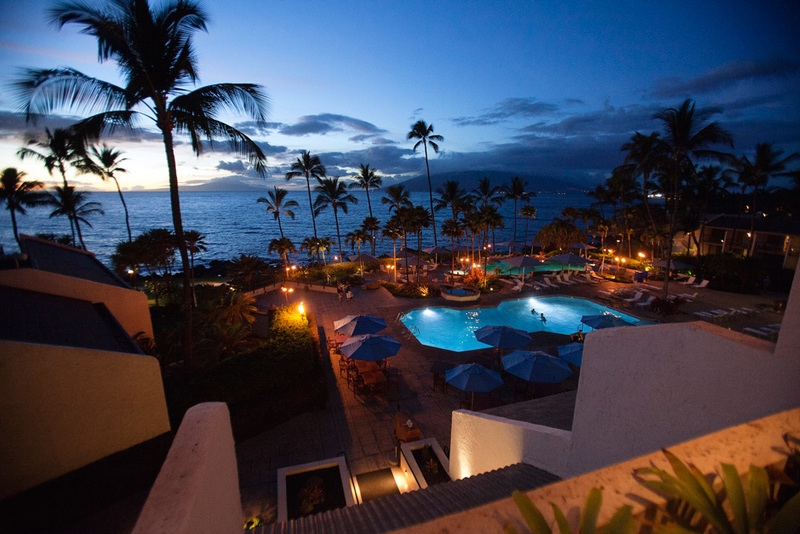 All the locals are super nice, perhaps due to the fact that tourism is one of the only industries left in Maui2; it seems like most people living there are in the service industry in some form or another3. 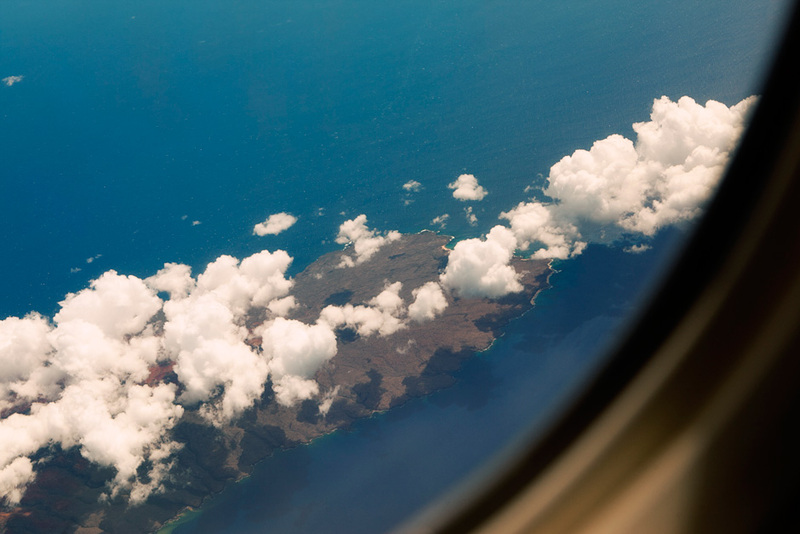 From the plane, you can see the low-hanging clouds casting distinct shadows on the islands. 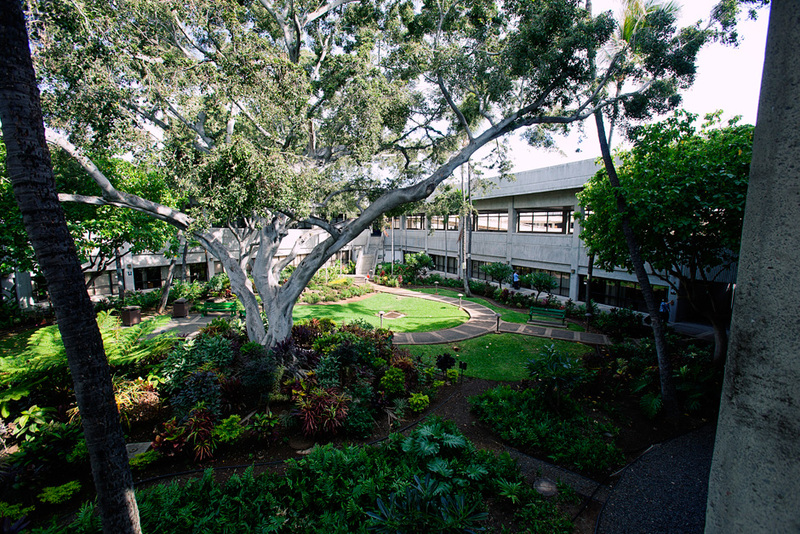 The airport in Honolulu has waiting gates out in the open air, and large trees like this growing in the middle of the terminals. 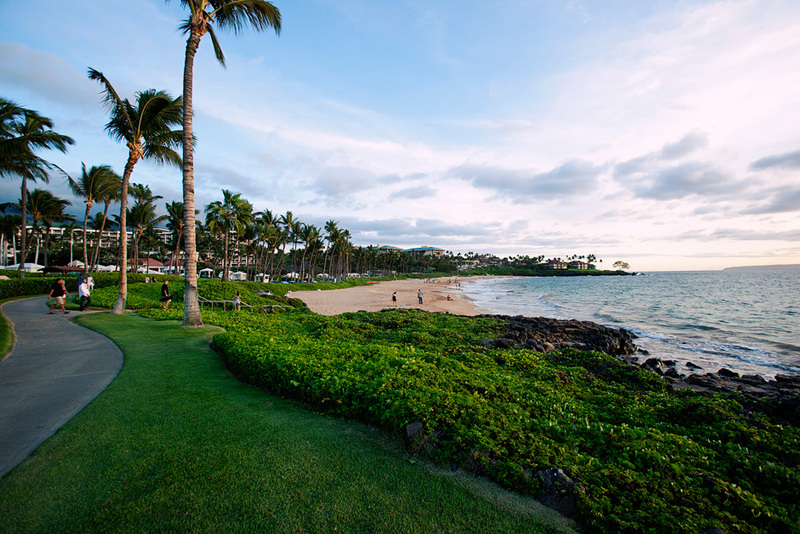 Both the Wailea Beach Marriott Resort & Spa and the Four Seasons Resort are along the beach, with a path that connects them together. Most of the coconut trees bear fruit, but the ones found in resorts are kept bare, out of fear that a coconut may fall and injure someone. As you move to less busy parts of the island, there are coconuts aplenty dangling from the tops. Table for one with a view of the sunset. 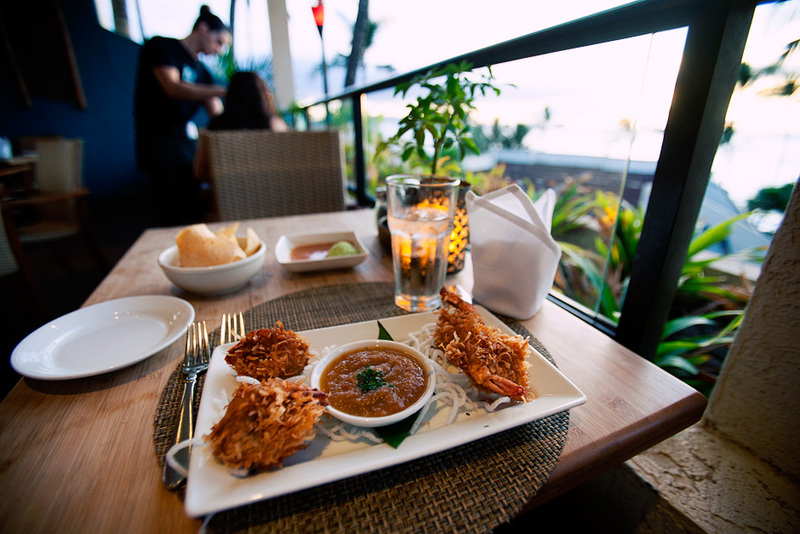 Gigantic crispy coconut shrimp, served with Chile de Arbol dipping sauce. The coconut makes this a very mild but delicious appetizer. A gift bag from Jenny and Dave, awaiting my arrival at the resort, filled with goodies and essentials like bottled water, hand sanitizer, gum, waterproof sunblock, a towel, a first aid kit, candy, lip balm, Gravol (for sea sickness), Aspirin, and an underwater camera. 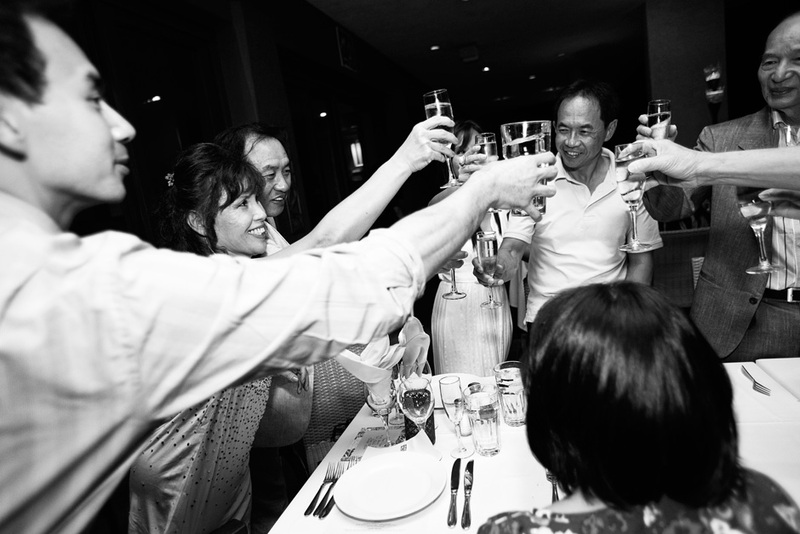 Toasts with the parents from both families. China, the best man, shows us his underwear. Found this collection of fish tail skeletons at a dock. The typical Aloha shirt and occasional kukui nut lei (necklace) are part of the uniforms, for the bell boys to the drivers to the janitors. 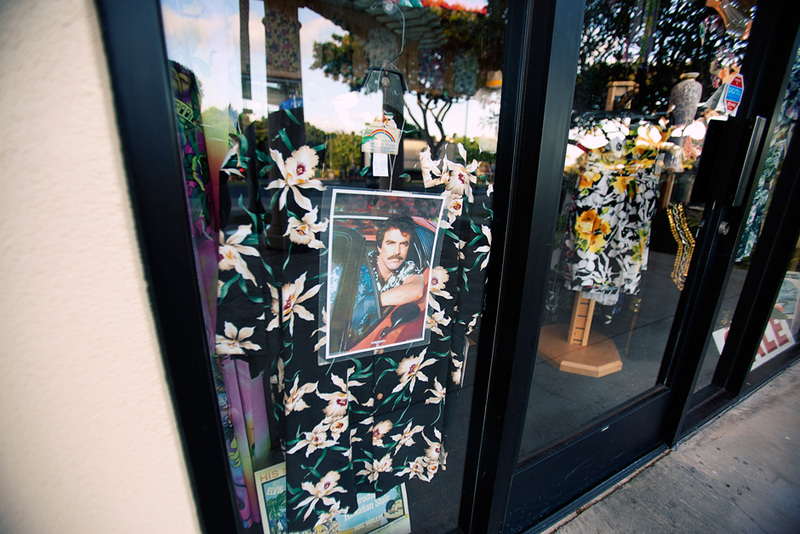 This shop had several flavours of the Aloha shirt, each adorned with a picture of Tom Selleck as Magnum PI wearing that exact shirt. 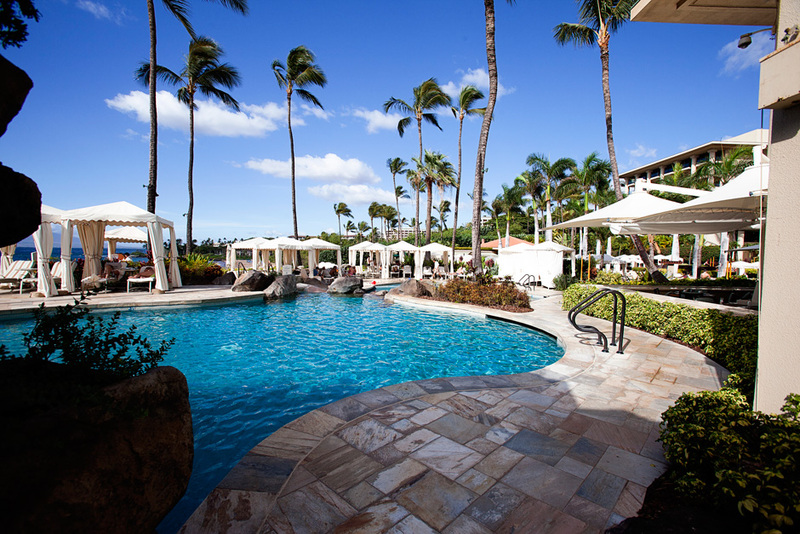 There are several pools at each resort, with water slides on some, and lounging chairs surrounding them. There were about 30 people in our group, a decent number for a destination wedding. The perfect place to lie in a hammock and read a book. 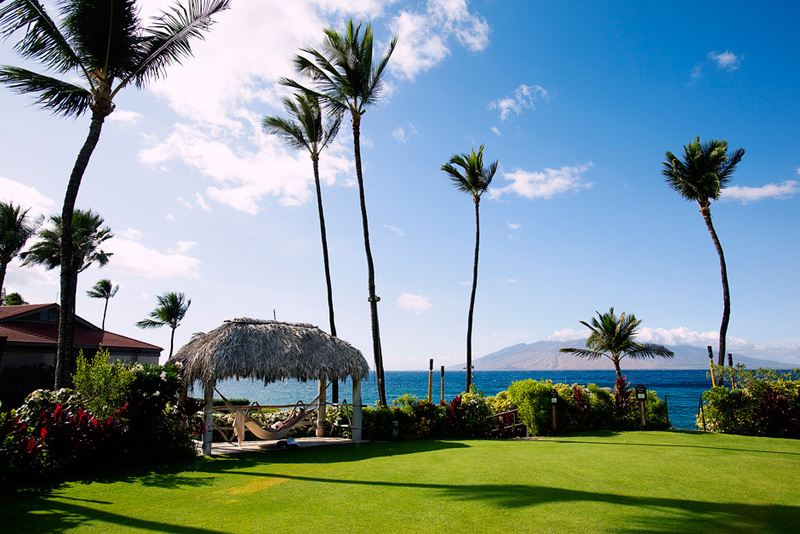 This ocean-front lawn was also the venue for the wedding ceremony and reception. My first time finding an infinity pool, which was saltwater for some reason. 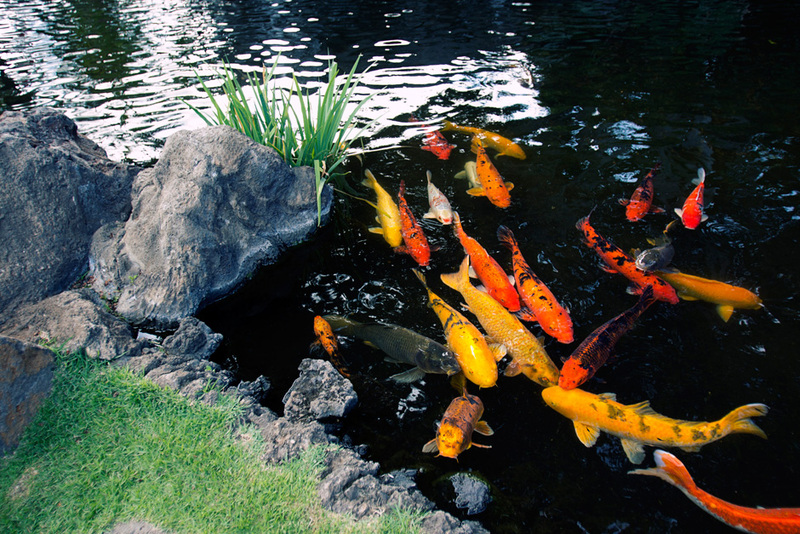 The koi pond at the entrance of the Marriott. Animals run around everywhere, and I even saw a tiny gecko crawling on the walls of the resort. 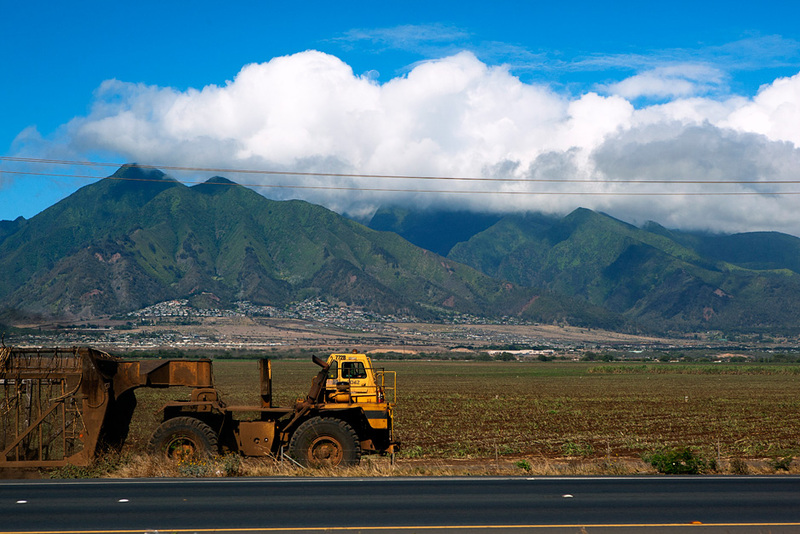 When arriving and departing there are lots of warnings and controls to preserve the delicate state of nature in Hawaii, due to the fact that there’s so much endemism here. 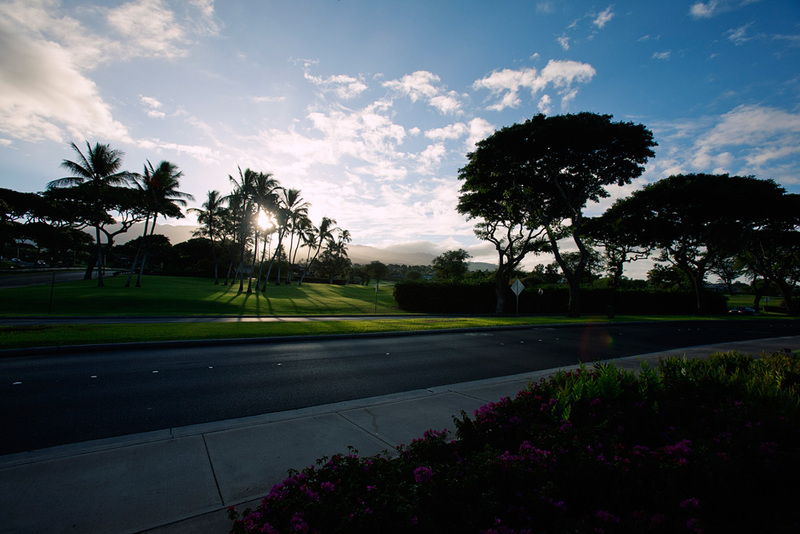 Waiting for the sun to clear the trees on a Maui morning. 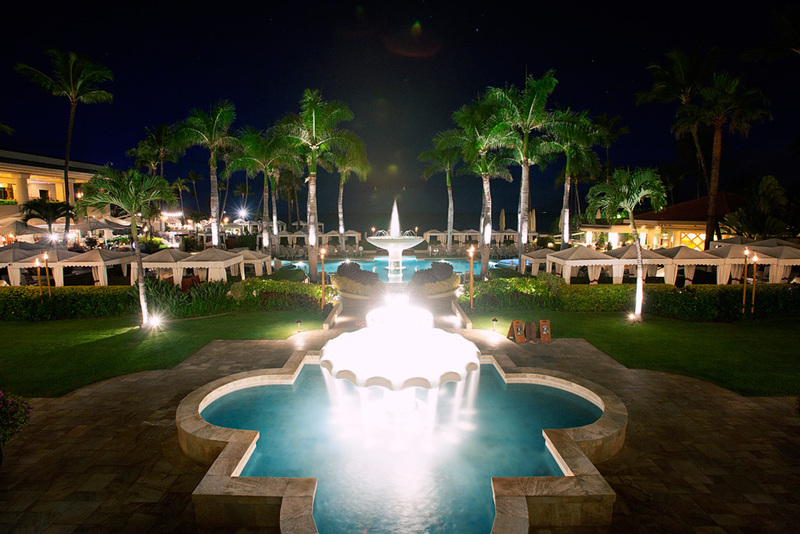 The main fountain that greets people as they enter the resort proper at the Four Seasons. Each island has it’s own weather patterns, due to the mountains causing micro climates; some are hot and dry while others are humid all year round, even though they’re all in close proximity. The topography here is very varied. 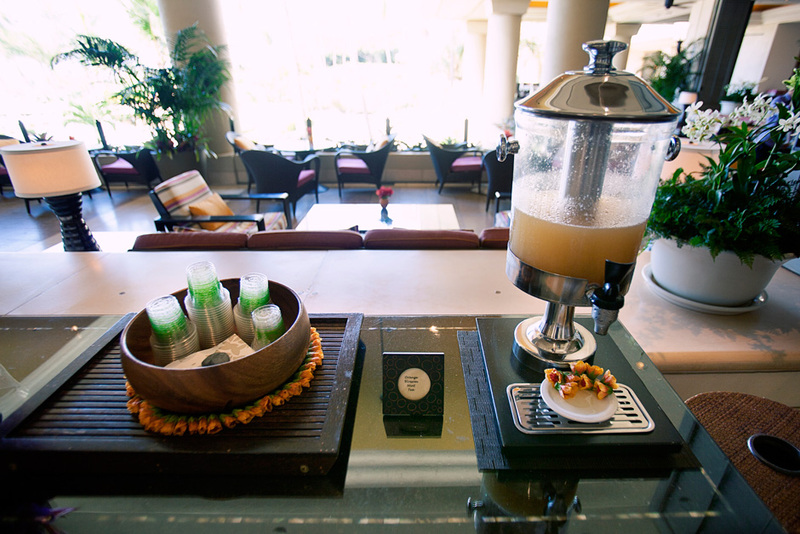 Complimentary orange blossom mint tea, in the lobby at the Four Seasons. So refreshing. 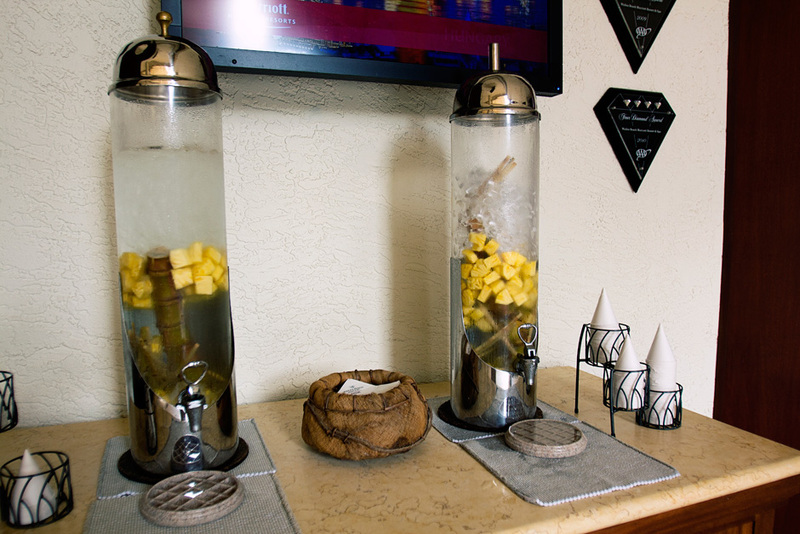 The Marriott has water infused with pineapple and sugar cane. Mr. Cunningham and his fashionable stubble. The air is superbly clear and mild. One of the first things I noticed when I stepped off the plane was how neutral everything smelled. I had to ask people where they go for vacation when they live in a place where the weather is perfect year round. Aside from one cabbie who said that he goes to Idaho to visit his family (and he always looks forward to the end of his vacation so he can come back), everyone else said Las Vegas. Apparently there’s a big Hawaiian community there. 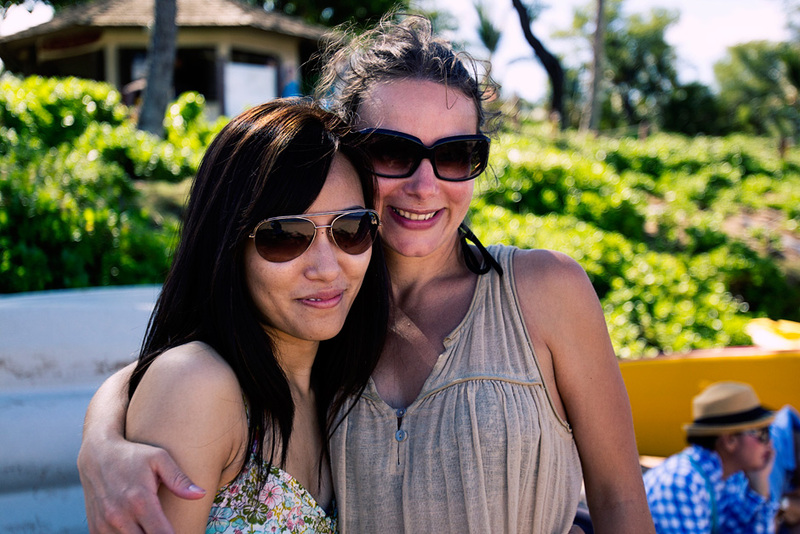 The day before the wedding, we went on the Kai Kanini Boat Tour. 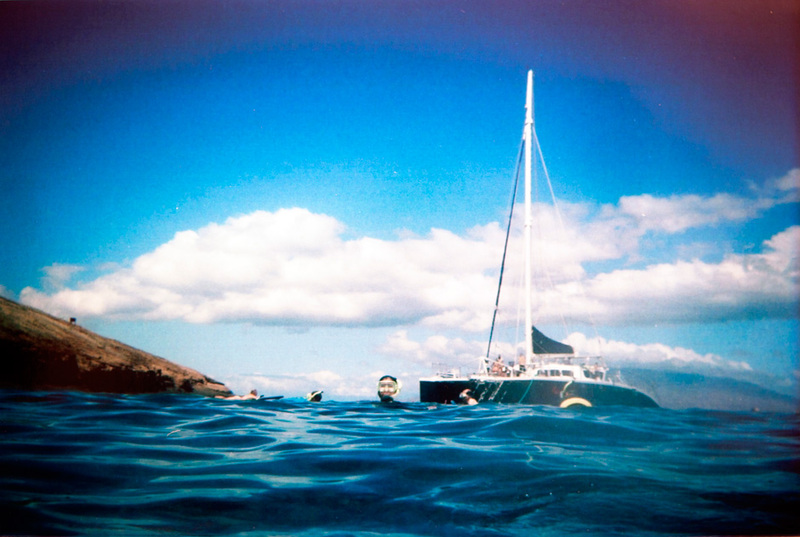 A catamaran at Makena beach takes a quick 15-minute trip to the Molokini Crater for snorkeling and snuba (which I didn’t get to try, but I so wanted to as soon as I saw it). 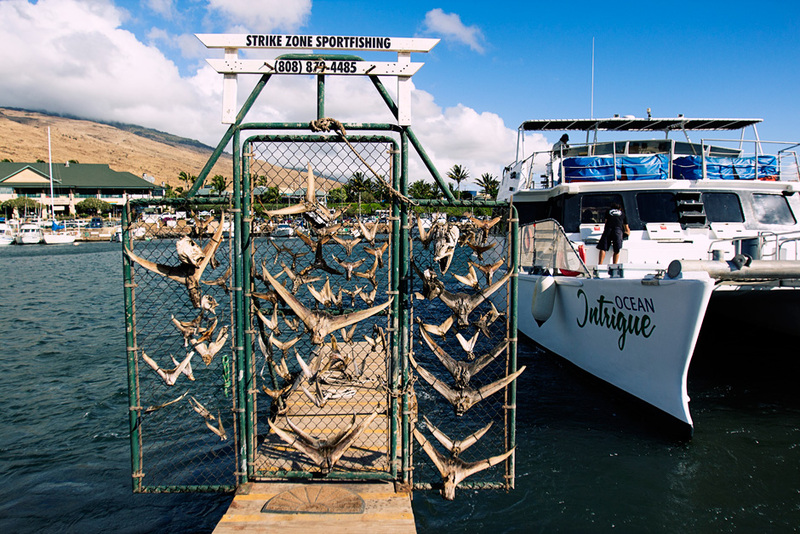 After, they had Mai Tais and beers on tap in the boat to go along with a deli-style lunch. Sunblock train on the boat ride to the crater. The skies are clear and the distance to the sun much shorter, so it’s a good idea to stay well protected. Molokini Island is a partially sunken volcano crater. I was even provided with a mask that matched the prescription of my glasses. When I first put the snorkel in my mouth, I thought, “Wow, the last person who used this must have been eating some really salty chips”. Then I realized we were surrounded by salt water, which I’d never been in before. Turns out it stings much worse than fresh water if you get any up your nose, and leaves your skin and hair covered in a film of salt. 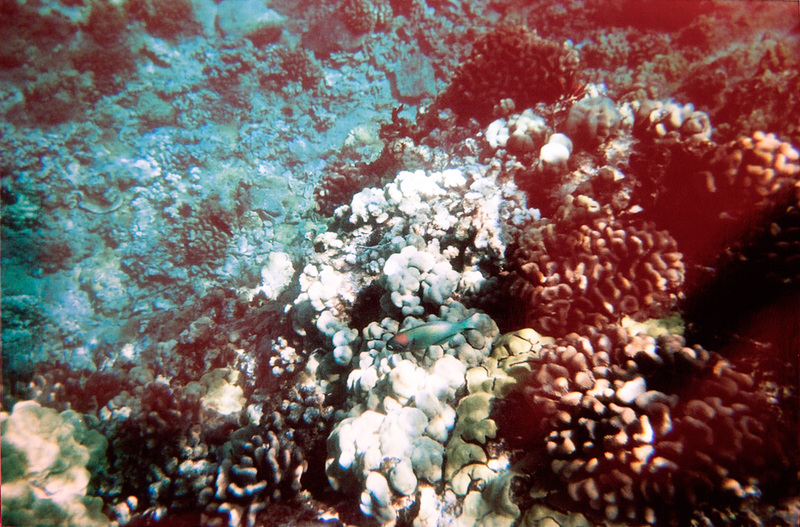 The photos from my modest, 800 ISO disposable underwater camera don’t do justice to the clarity of the water. The fish are so tame they swim up to you and nibble your fingers if you can keep still for long enough. I hadn’t shot on film since I was a little kid. I only had 27 exposures and no viewfinder to preview my photos, so I did my best to make each shot count. 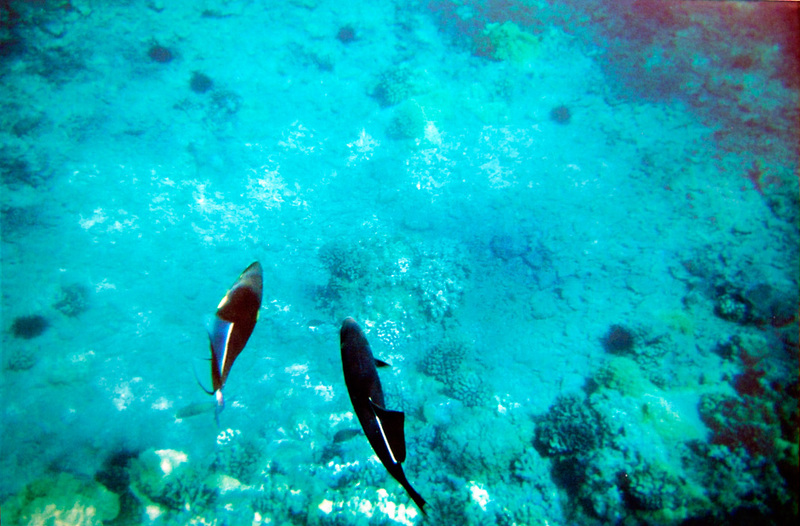 Unfortunately, trying to get the proper shot underwater also tends to scare away the fish. 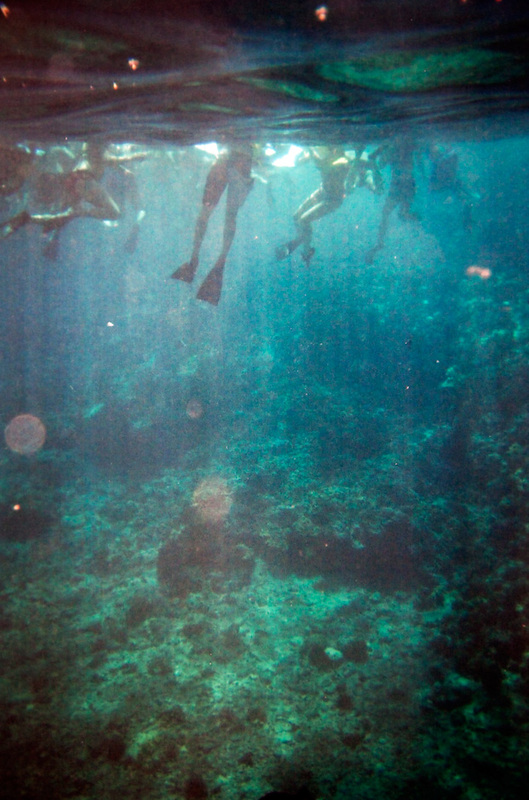 Even if you try swimming to the bottom, the natural buoyancy of the human body makes it hard to stay down long enough to take a decent photo, and the light falls off significantly as you go deeper. 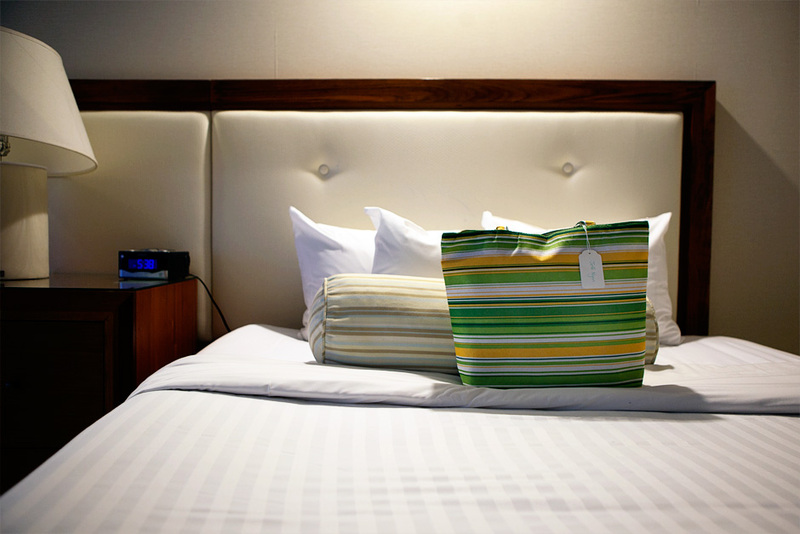 This pictures brought back some lovely memories for me – however next time I’m staying at the Four Seasons!!! 1) So THAT explains the plethora of Hawaiian shirts with white guys…. I’d forgotten about Magnum PI…. 4) Food pic is gorgeous, dammit now I’m hungry. 5) Rooftop pic is magazine worthy! Looks like fun! Where are the pictures of cutie-you having fun?! I’m the one in the snorkel mask! Didn’t you recognize me? Hahahah…I probably look different with the goggles stretching out my face (and no glasses). I did know that was you … but you know you can put more pictures of the blog star up here to entice the chicks! Oh wait – WOWZER! New post!